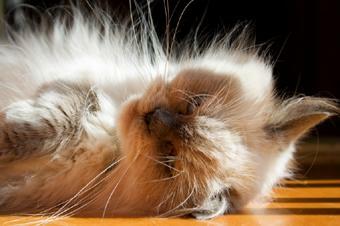 Feline kidney disease is the leading cause of death for older cats. There are various causes and treatments for this serious feline ailment, and spotting the symptoms can help you manage your cat's illness to improve her quality of life. According to Long Beach Animal Hospital, kidney disease may be divided into two distinct types. Both types result in kidney failure, but the onset of each has a different cause. This type of kidney disease is characterized by complete organ failure; the kidneys simply cease to function. Onset is usually quite sudden, can happen at any age and is usually caused by the ingestion of toxins, most notably anti-freeze. Other causes of acute renal failure include, but are not limited to, bacterial or viral infections, trauma and immune system diseases. Acute renal failure is almost always fatal, but if treated immediately and aggressively by your veterinarian, the kidneys regain their function and your cat goes on to live a normal lifespan. The key is getting immediate medical attention. If you think your cat has lapped up some anti-freeze and shows any of the symptoms described below, take him/her to the vet's office at once. Chronic renal failure is the most common form of kidney disease. If your cat lives long enough, chances are he will eventually develop this illness. Although this may sound dire, it is really just a reflection of the fact that cats are living much longer lives due to improved diet and veterinary care. Chronic renal failure is a slow decline in kidney function, and as such, it can be difficult to notice at first. Kidney function has to be decreased by as much as 70 percent before it begins to affect a cat's general health. Outside of a complete kidney transplant, chronic kidney disease is progressive and results in death. That said, if your cat is diagnosed with this disease, you can manage it in much the same way as people care for cats with diabetes and keep your cat in relatively good overall condition for months, if not years. You can check your cat for dehydration by pulling up a fold of skin at the scruff of the neck and releasing it. If it quickly resumes its original shape, your cat may be well-hydrated, but if it holds the peak and only slowly returns to its original shape, your cat is dehydrated and you should seek treatment at once. Your vet can provide some immediate relief by putting the cat on IV fluids while the situation is being assessed. Where renal failure is being considered as a possibility, creatinine and BUN are listed as the most important diagnostic leads. The Feline Chronic Renal Failure Information Center states that when either of these two blood components are elevated, it is likely that as much as 70 percent of your cat's kidney function has already been lost. A high level of phosphorus is also an indicative mark for renal failure. Ill-functioning kidneys will allow phosphorus to accumulate in the blood since the kidneys can no longer efficiently excrete it. Cats that present symptoms of chronic kidney disease should be screened for these aforementioned conditions and vice versa. In fact, the American Veterinary Medicine Association has noted a very clear link between periodontal disease and kidney disease, one that may play an important role in future preventative measures. The most common and effective treatment for kidney disease is to administer fluids. This not only re-hydrates your cat; it flushes toxins out of the kidneys as well. Administering fluids is something you can easily learn to do yourself at home rather than putting your pet through the stress of going to the vet for every treatment. Fluid therapy involves administering subcutaneous injections of lactated Ringer's, a type of saline solution. You can purchase the 1,000 cc bags of fluid, tubing and needles all online with a vet's prescription, which can be significantly less expensive than buying it from the vet. Your vet can teach you the procedure. This may sound intimidating, but it's easy once you've done it a time or two. You will learn how to attach the tubing and needles to the fluid bag, how to insert the needle and start the fluid flow. When you first learn the process of actually injecting fluids under your cat's skin, you might think "There's no way my cat is going to sit still for this...", but you may be surprised. Dehydration makes cats feel miserable, and they quickly learn that even though the prick of the needle going through their skin is unpleasant, the result makes them feel immeasurably better. Many cats come to actually look forward to "getting their water", and you can make this an opportunity to spend cuddle time together. Once you become proficient, the whole process shouldn't take more than ten or fifteen minutes. Be aware, it takes a while for a cat to absorb the fluids. Immediately after treatment, you may notice a spongy spot on your cat at the injection site. Don't worry, this is normal and will subside as the fluids are absorbed into kitty's tissues. Your vet will want to see your kitty periodically to re-check blood levels and adjust therapy accordingly. There is no cure for feline kidney disease outside of a kidney transplant, but you can manage the illness with a little fortitude. Home fluid therapy can make your pet feel much better, keep the kidneys functioning and extend your pet's life. Some research also supports specific dietary modifications. although dietary changes should not be used as a sole treatment, talk to your vet regarding any holistic and dietary approaches that may be useful in conjunction with your pet's management.